KIM PHILBY -- NEW RUSSIAN GOD? Russia after the collapse of the Soviet Union has received many labels ranging from "democratic" to "kleptocracy." A recent ceremony unveiling a memorial plaque , however, subtly declares that the "new" Russia sees the future exactly as did the defunct USSR. In reality, the present Russian government should be seen either as neo-Communist or Soviet II. 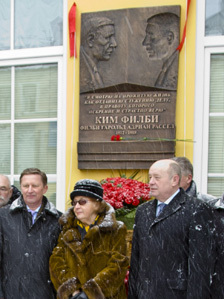 The plaque is dedicated to Cold War master spy Kim Philby, an individual born into the British class and colonial traditions, but who became one of Moscow's most damaging spies. The method chosen by the Russian elite to commemorate Philby was to cast him as the major Roman god Janus. Depicted with two faces looking in opposite directions, Janus was seen as the god of beginnings, and some ancients understood Janus to be a god of wisdom, since he knew the past and saw the future. This is how the Russian elite see Philby: a man born into the old British aristocracy but who looked forward to the establishment of a very different world, a Communist world. It is also evident that the present Russian political elite share Philby's vision of a Marxist future. The plaque testifies to Philby faithfulness to his Communist beliefs, and Itar-Tass, Russia's state-run press agency, proclaimed the Soviet spy as "legendary." The continuing importance of Philby to Moscow's intelligence community was verified by the participation of Deputy Prime Minister Sergei Ivanov and the head of Russian foreign intelligence, Mikhail Fradkov. Russia's spy services trace their origin to the original Bolshevik secret police, which was established by Communist revolutionary leader Vladimir Lenin and is best known by it's acronym, Cheka. 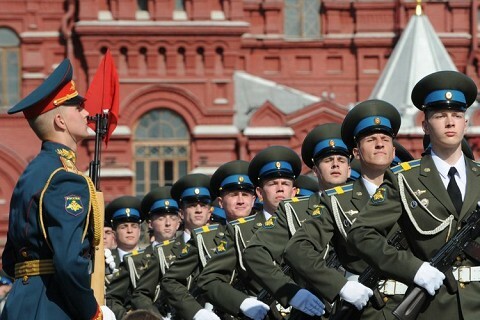 Today's Russian intelligence officers, retired or still serving, refer to themselves as Chekists. Philby's espionage activities, which cost many lives, were completely in line with the Chekist tradition. 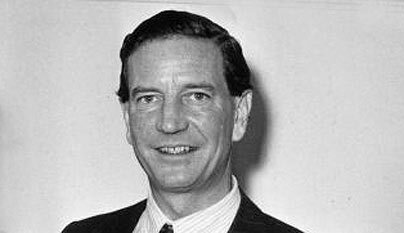 Philby was a high ranking British counterintelligence officer who nearly became the head of all British foreign intelligence, MI6, and was part of the infamous Cambridge spy ring. Philby's actions in support of the Soviet Union began in the 1930s and continued to 1963, when he fled to the Soviet Union as British intelligence closed in on him. He continued to assist Soviet intelligence in the training of spies until the time of his death in 1989. Philby's spying against Britain and the U.S. was both instrumental in the identification and murder of pro-West intelligence officers, and was alert to individuals who sought to defect to the West. One particular incident demonstrates how Philby used his high position in counterintelligence to protect Communist agents and destroy the lives of would-be defectors to the West. 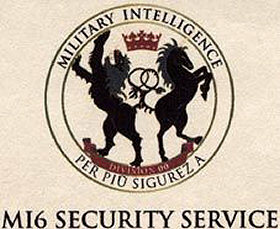 In August 1945 Philby was the head of Section IX of Britain's Secret Intelligence Service (SIS, also known as MI6) . Philby's duties were to collect and analyze information on all Communist activities outside of Britain. In effect, a Communist spy was in charge of all information gained by British agents concerning Communist spies. The obvious advantages of Philby's position were used to the fullest extent when a Vice-Consul of the Soviet Consulate in Istanbul, Turkey, decided to defect to the British. Konstantin Volkov was not merely a Vice-Consul, he was also a member of the NKVD, a forerunner of the more familiar KGB, who had earlier been stationed at NKVD headquarters in Moscow. Among other important pieces of information , Volkov agreed offered to reveal the names of Soviet agents and the workings of Soviet spy networks around the world. He also stated that he knew the names of three Soviet agents working in Britain, one of whom headed a counter-espionage organization in London. The Volkov case file was handed to Philby for determination as to how to proceed. Philby was to decide if Volkov was genuine or a Soviet ploy. Philby carefully examined the file of the man who knew that he, Philby, was a Communist agent. Philby was to meet with Volkov in Istanbul, but the meeting never took place. Soviet authorities claimed that Volkov had been suddenly recalled to Moscow, after which he never again appeared. In his autobiography, My Silent War, Philby wrote that he provided his superiors with several possible scenarios as to why Volkov disappeared, and that he further admitted that "the truth might never be known." Then Philby slyly tells his readers that "Another theory - that the Russians had been tipped off about Volkov's approach to the British - had no solid evidence to support it. It was not worth including in the report." Philby's "War" had claimed another life, one that could have protected the world against aggressive Soviet espionage activities and doubtlessly saved many lives. This is the kind of person that the "new" Russia lionizes, as it has heaped praise on other Cold War spies, including the notorious master of the East German secret police, known as "the man without a face," Marcus Wolf, and George Koval, who was instrumental in giving the atomic bomb to the Soviet Union. The political elite of the "new" Russia share Phlby's vision of the future, but this vision is a nightmare for everyone who treasures our God-given right to live as a free people, and apart from the dictates of a Marxist Janus. But let us now turn away from that darkness and toward the shining, life-giving truth which leads us to Bethlehem -- and a very Merry Christmas! Mr. Toby Westerman, author of LIES, TERROR, AND THE RISE OF THE NEO-COMMUNIST EMPIRE: ORIGINS AND DIRECTION, is the editor and publisher of International News Analysis Today (www.inatoday.com). INTERNATIONAL NEWS ANALYSIS IS BRINGING TO ITS READERS SPECIAL ISSUE THE INA DIRECT SOURCE REPORT: "THE ROOTS OF SOVIET ESPIONAGE AND DISINFORMATION"
This in-depth analysis reveals the origins of today's spy headlines. "THE ROOTS OF SOVIET ESPIONAGE AND DISINFORMATION" will be sent directly to you via email after your payment of only $24.95 has been received.